I wanted to bake something but I can’t because we have no table for the last three days. We had a dining table make-over just this week. It is really hard to cook meals because of the limited space in our kitchen so I was not able to try new recipe. 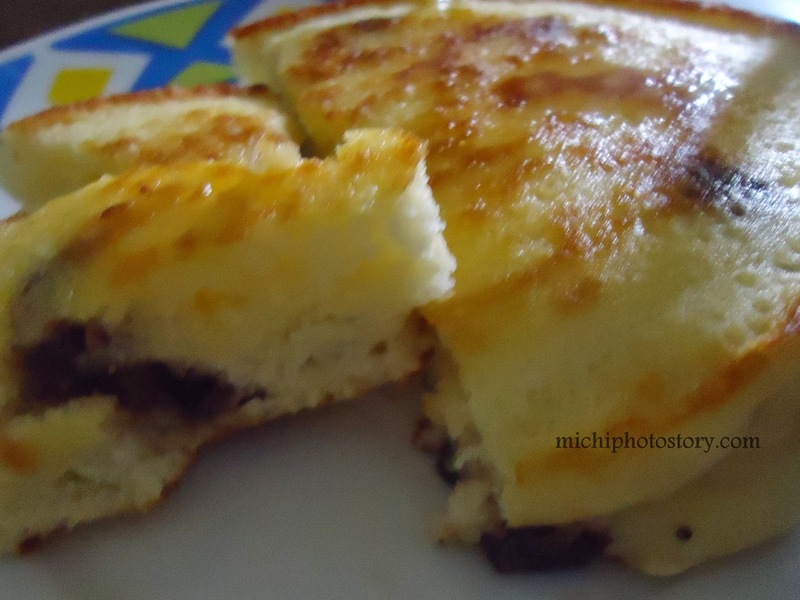 The only thing I’ve tried this week is chocolate chip pancake, I always use Maya instant pancake mix but this time I tried new product “Bisquick”. As per directions, mix 2 cups Bisquick, 1 cup milk and 2 eggs then I add ½ cup of chocolate chips. My son loves this because of the chocolate chips. Hehe! Street fairs and farmers market have become incredibly popular over the last few years. It seems like every weekend there is a different street fair or market where you can go and buy great things. In fact, many communities have started regular weekly street fairs and farmers markets that draw large crowds. Here are some things to think about when buying food at these events. The great thing about these local markets is that they really support the local community. These markets are staffed by vendors who usually grow or produce their food locally, and the market may be the main way they sell their produce or other items. As a result, when you buy from them, not only are you buying locally grown produce (which is very popular now as well), you are also supporting a local business. Many of these markets also offer some great eats! With the new trend of foodtrucks sweeping the nation, you can find some great gourmet food served out of a van at these fairs and markets! 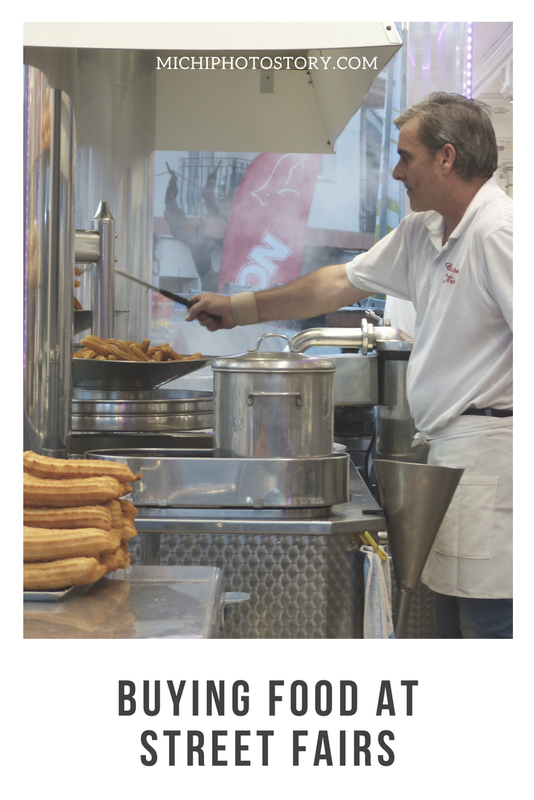 Many vendors also sell their food, produce, and sauces so that you can take them home and make them yourself in the comfort of your own kitchen. The biggest drawback of these street fairs and farmers markets is usually the price of what you are going to buy. Prices at these markets typically tend to be higher than at stores in town, or national chains. The reason is that these vendors typically don’t benefit from cost savings that large stores benefit from. The can’t scale well and don’t realize a lot of cost savings as a result. As such, you as the consumer pay more. Also, you typically can’t find any discounts, like net voucher codes, which you could find for regular grocery stores or other online shopping. This also makes the cost of shopping at a farmers market higher than a regular store. 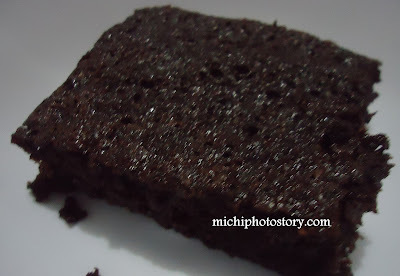 It’s been a year since the last time I baked brownies. 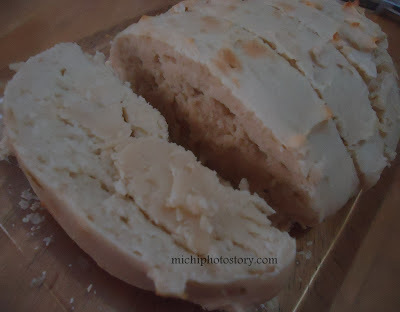 I found this recipe from food.com. 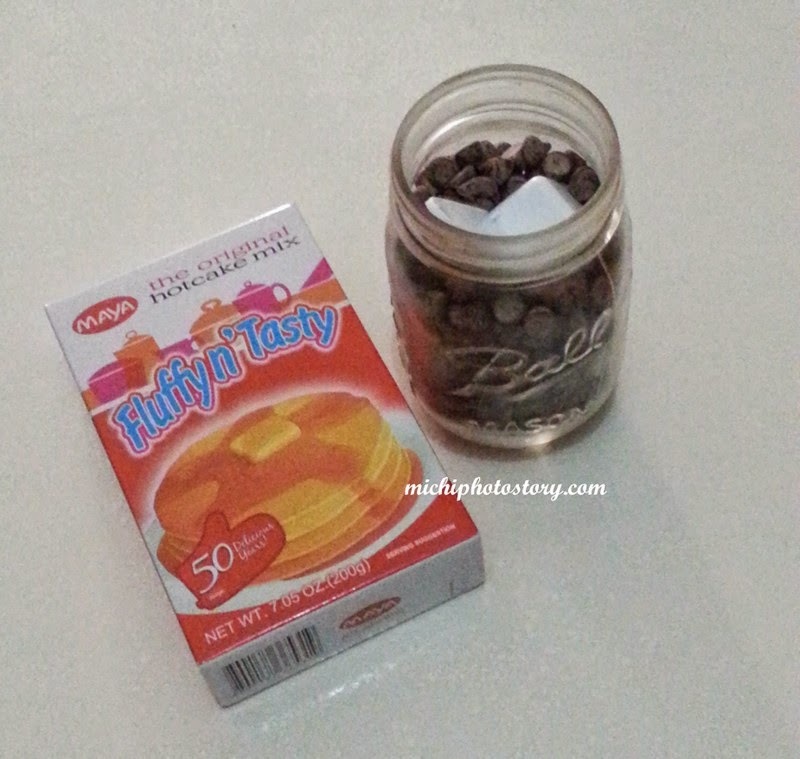 I checked the ingredients and procedures and it looks so easy so I tried it yesterday. 2 Mix oil and sugar until well blended. 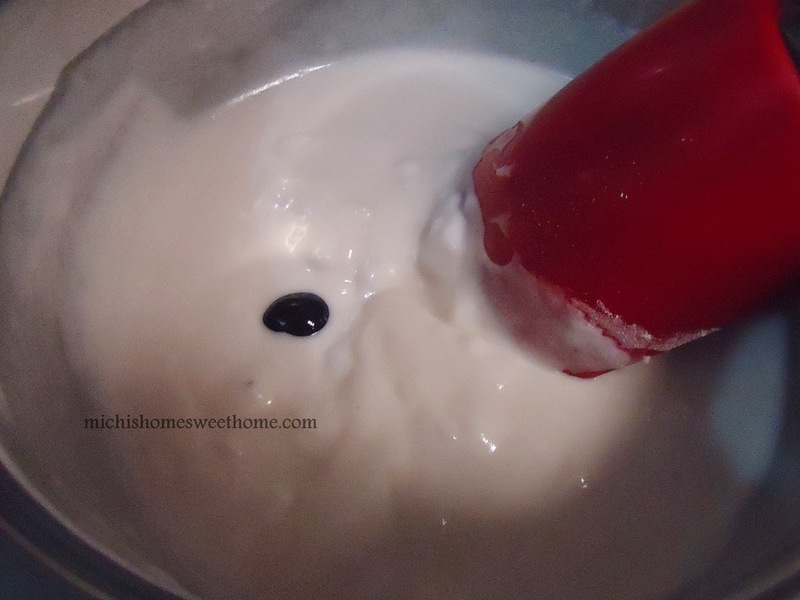 3 Add eggs and vanilla; stir just until blended. 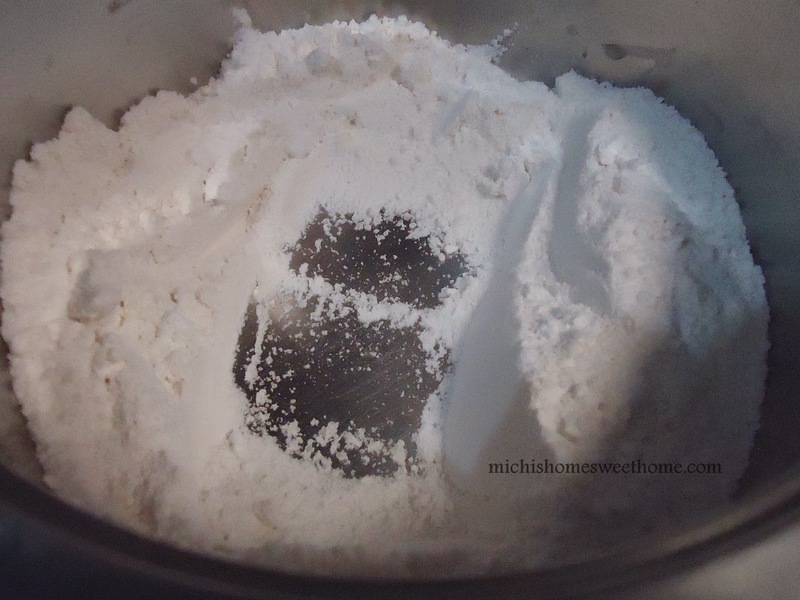 4 Mix all dry ingredients in a separate bowl. 5 Stir dry ingredients into the oil/sugar mixture. 6 Pour into greased 9 x 9 square pan. 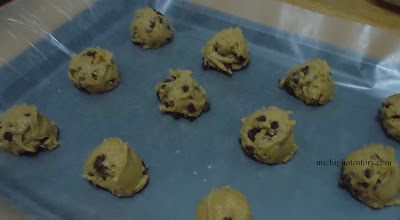 7 Bake for 20 minutes or until sides just start to pull away from the pan. 8 Cool completely before cutting. 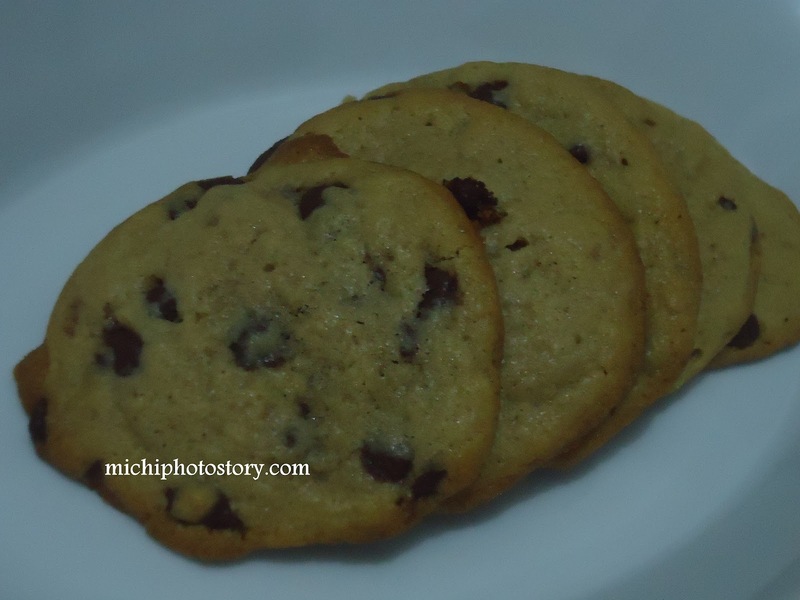 This is indeed a simple and easy recipe because I don’t need a mixer to mix all the ingredients and I can make this is less than 30 minutes. We all love the brownies and it is better than my previous recipe. It is so moist, gooey and not overly sweet. The only thing I notice is, it is a little bit oily maybe because I use vegetable oil. Next time I will reduce the oil to 1/3 cup and will see what will happen. 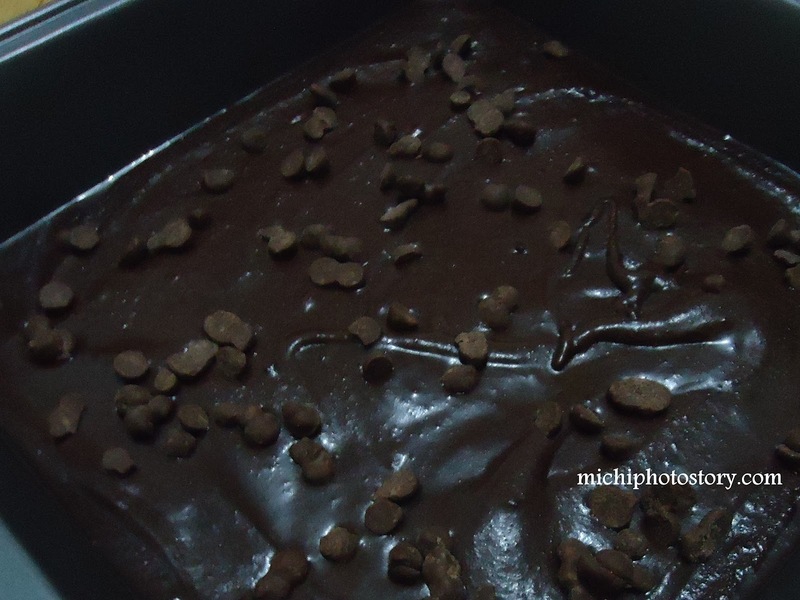 One more thing I need to double the recipe because we ate 3/4 of the brownies in one sitting. I don't know why it is not smooth on the top. 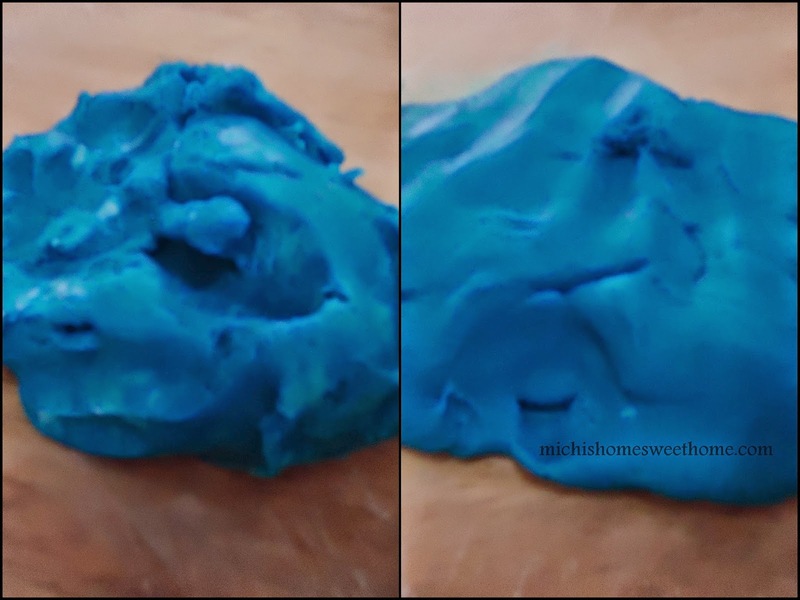 Two months ago I’ve made my first homemade play dough and this is now the third time that I’ve made this. 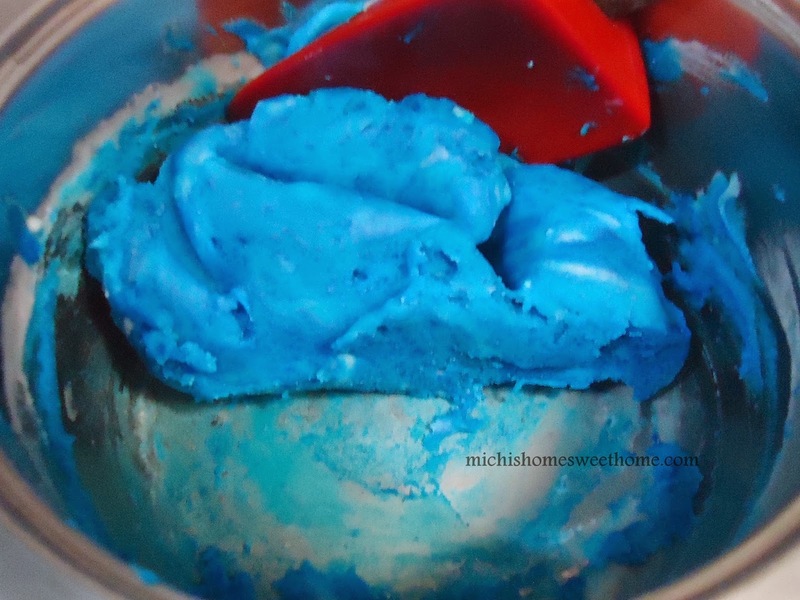 It seems that every month I’m cooking play dough. 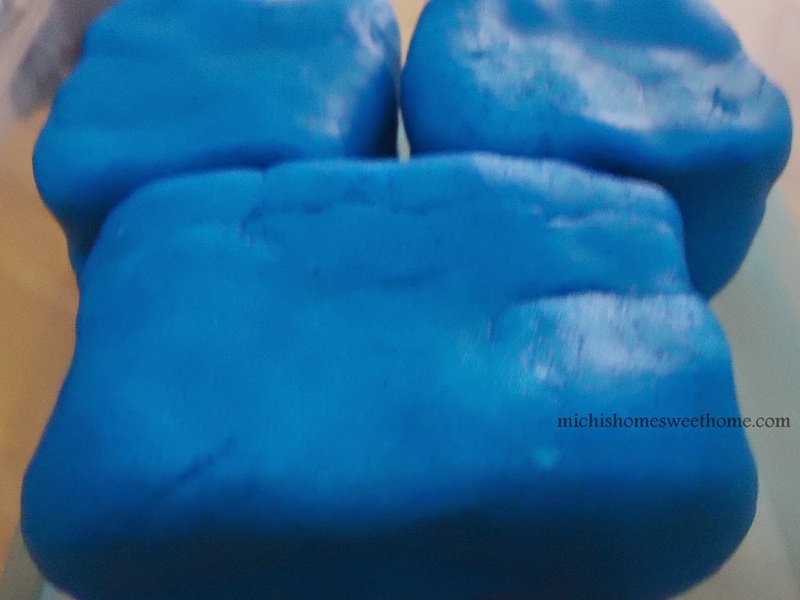 My son always reminds me to cook clay if his play dough runs out. I don’t know if it is a good idea that he knows that I can make this. Hehe! 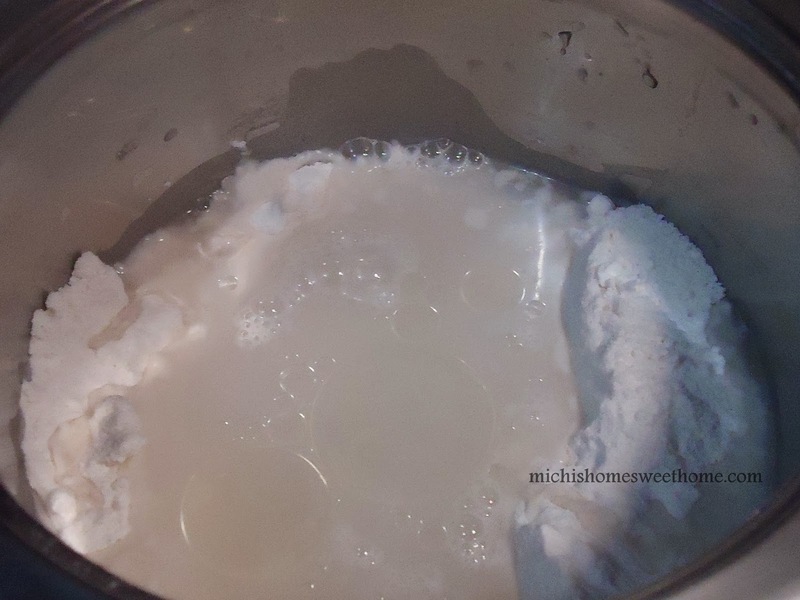 Again, I got my recipe from "Musings from a stay at home mom". 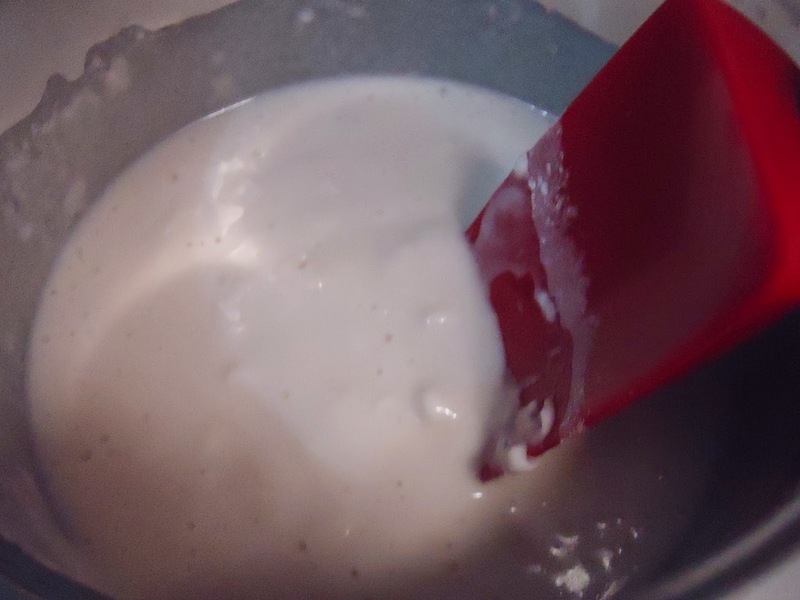 Mix flour, cream of tartar and salt. Cook over low/medium heat, stirring. Once it begins to thicken, add the food coloring. I put my play dough in air tight container for storage. 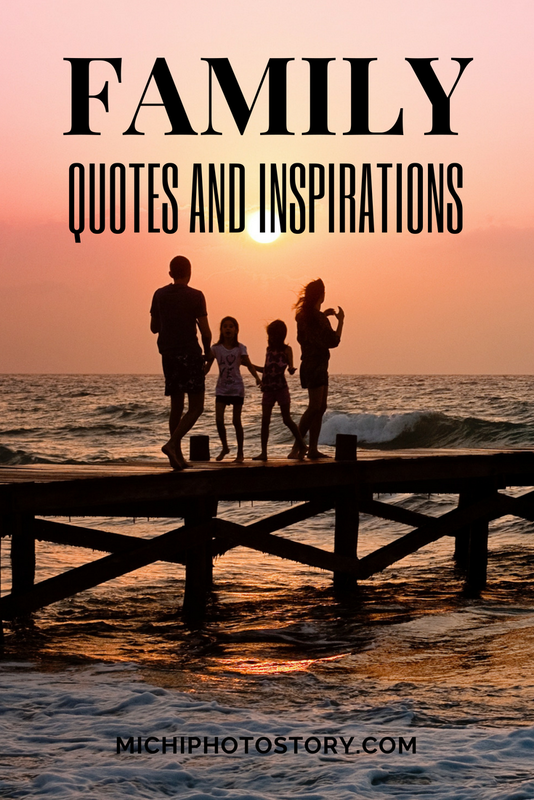 Quotes and inspirations for parents and family. “Children will not remember you for the material things you provided but for the feeling that you cherished them” – Richard Evans. A few weeks ago my husband asked me if I want to have a vanity dresser and I said no. You may find it weird because I’m a woman and most of the women love to have a vanity dresser but if there is one thing that I really want to have is a home office. Not because I really work at home but I want to have my own space where I can spend my free time. A nook where I can read magazine and books, surf net and write blog posts, create craft or anything under the sun. It is a combination of library, home office and reader’s nook. I was reading an article and according to Zimmerman, here are the important things that we need to consider in designing our home office. Determine our needs – Do we need computers, storage, meeting space or project station? In our case, we have our own laptops, one for hubby, one for me and one toy laptop for my son so we need at least two spaces for computers. We need storage for papers, mail, bills and a place for the telephone. A small square table will do in our home office just in case my son needs to do some project or group projects. 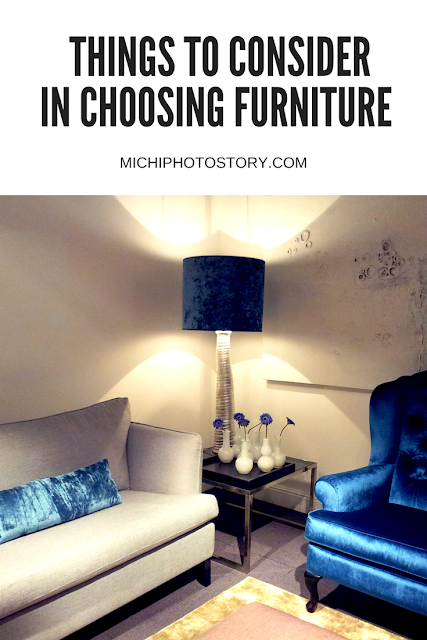 Pick a location - It is my dream to convert our guestroom to a home office. Develop a Plan - I’m saving this photo for my future home office. I want something like this. I’m not sure if I need to hire an interior designer or I could hire someone who can do my own designs with less professional fee. But according to Zimmerman, it is good to hire a professional designer to help you in planning. Some online shops like Office Furniture Express offer free consultancy service. How I wish we also have free consultancy here in the country. Create a Healthy Environment – this is very important because my son will also use this room so I need to ensure that our future home office would be safe and comfortable for everyone. How about you? Do you want to have a home office? 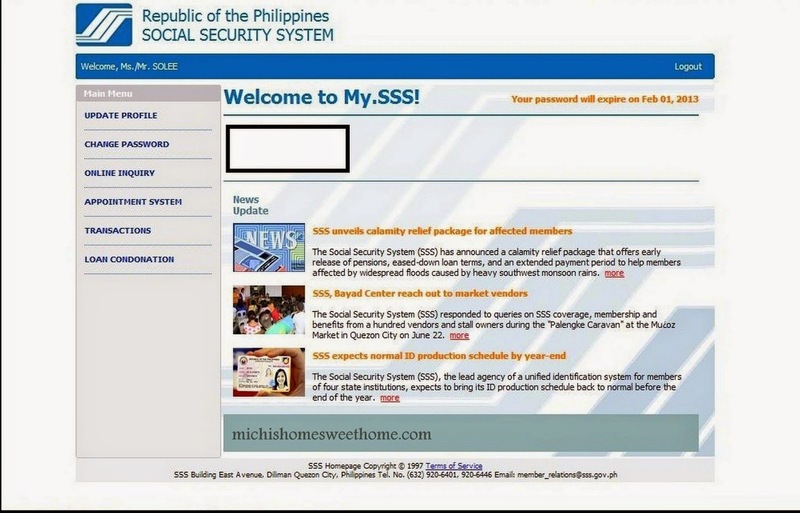 I’ve been a member of SSS since 2003 and even I stopped working I still continue paying my contributions but of course, the amount has been changed. I can’t remember the last time I’ve tried applying for SSS Loan, all I can remember is I was denied because of “mismatch name”. It took me months before I asked our HR department about the status of my SSS loan and those HR staff did not bother to inform me that my loan was denied. The only good thing is I was able to fix the problem. 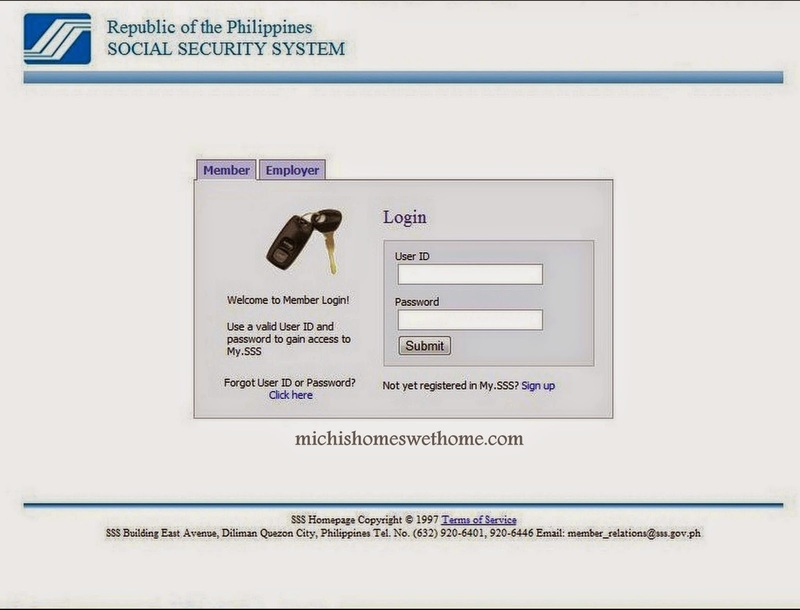 Well, I only need to update my SSS ID to my married name. 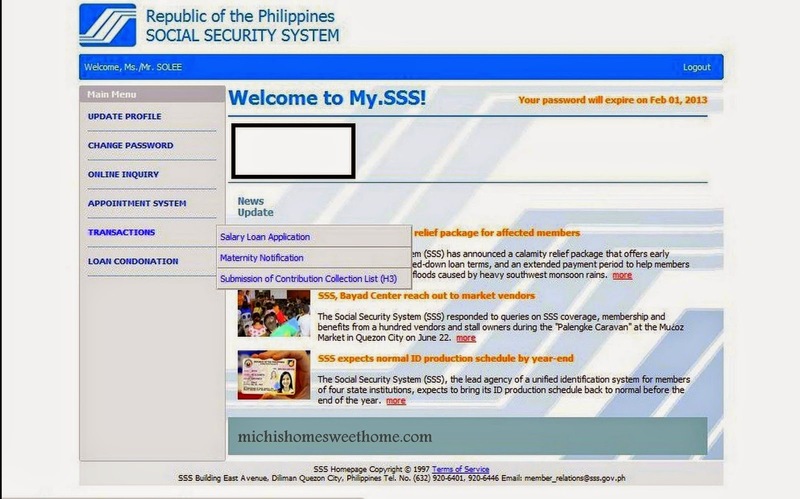 After receiving my new SSS ID, I did not apply for SSS Salary loan. Last month, while surfing the internet I’ve learned that I can apply for SSS Salary Loan via online. I was so curious so I tried it and it was really easy. 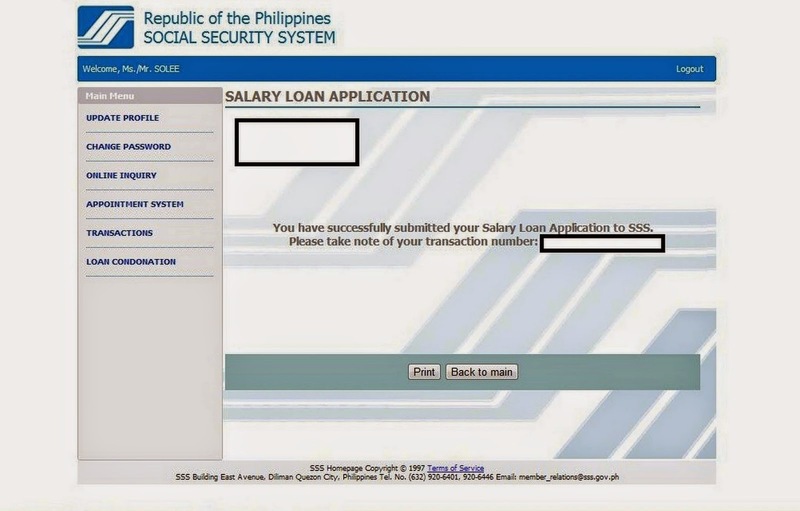 It took me a few minutes to apply for my salary loan last August 14, 2012. I received an email last August 23, 2012 stating that my salary loan has been approved and my check was generated. Since then I’ve been waiting for my check. Almost 2 weeks had passed and still no check so I email SSS regarding the status but got no reply. Just yesterday, a postman came holding a notice card to inform me that I have mail at the post office. He said, “nung isang lingo pa ma’m yung mail niyo, wala kasi tao dito lagi”. I asked what time he usually dropped by. He said ‘11AM’. Well, I’m still in school at that time. He said, he will be back to bring my mail and he did after 5PM. #extramile. I check the envelope stamp and I saw Aug 24, 2012 Q.C. Post Office and August 31, 2012 our post office. I’m not sure if that was fast because this was my first time experience. 1. Make sure you are registered online. If you are not registered, click here. 6. Check the “I agree to the terms and conditions” box and click ok.
7. Then you will see this. 8. That’s it! 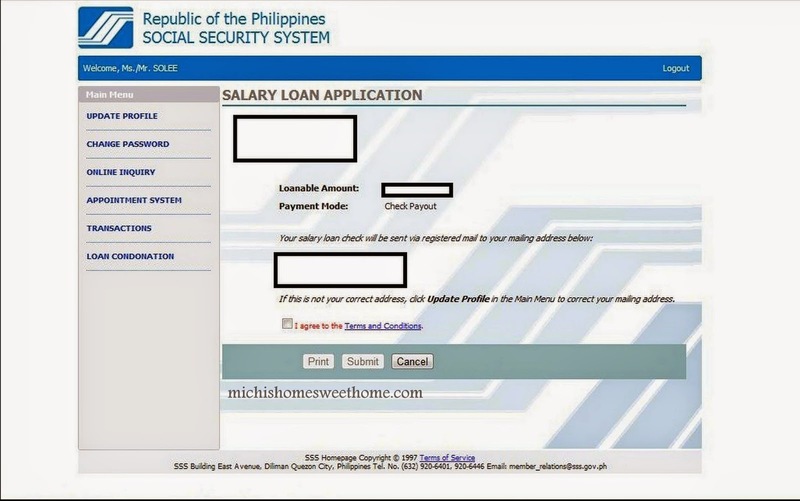 if you have an employer, SSS will notify your employer regarding your loan application. Employer approval is needed. Note: Check will be delivered to your home address. 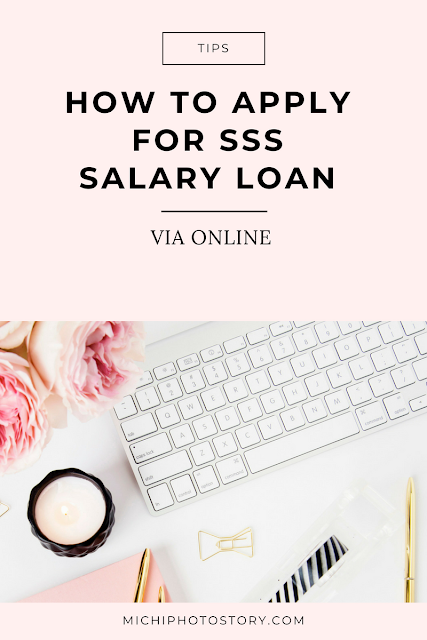 Pay your SSS Salary loan on or before the 10th of the month. 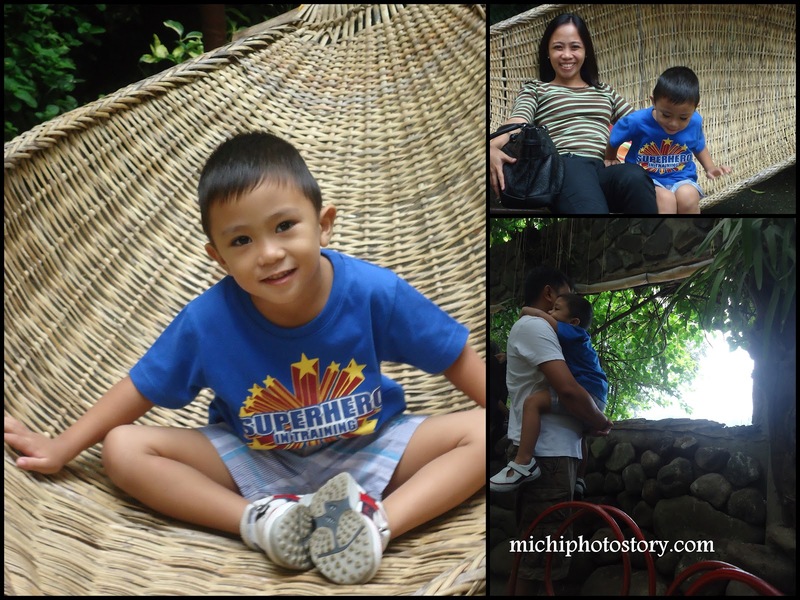 I only have one kid but I don’t want to spoil him so even he is still in toddler age, we still give him responsibility. Simple responsibility or chores that is appropriate to his age and strength. I found this photo and so far my son is doing most of the listed chores. He can keep his own toys even it took him forever to finish. I try not to help because in school they are responsible in keeping all their activities, snacks and others so consistency is important. If he wants to sweep the floor, I let him then I will just do it again. He can put dirty clothes in the hamper. He can put clothes in the washing machine. He can remove clothes from the hanger and sometimes he helps me in folding clothes but of course I have to repeat it again. Every time I hang our clothes, he gives me hanger. He always helps me whenever I bake, he helps me mixing the batter or he put baking paper in our muffin tray. He helps his dad in washing the car. He also helps his dad in removing weeds. He knows how to wipe his own mess. One month to go and he is turning four years old so I need to add more chores. 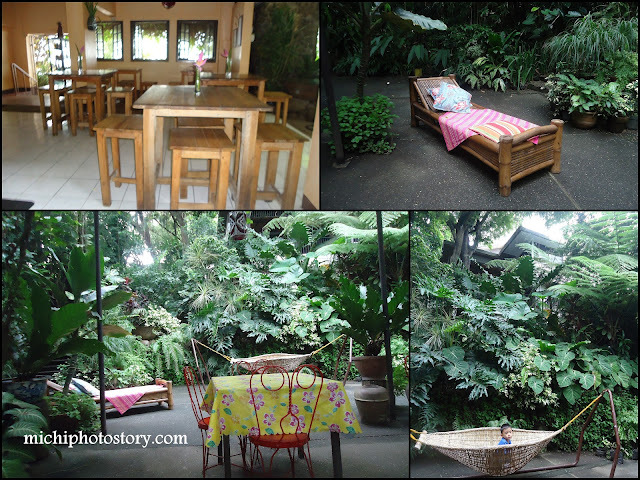 Real Cofee and Tea Café was listed on my Boracay food trip last year but we were not able to visit this place. Good thing that my husband went to Boracay last week for their company outing so I google and asked my sister-in-law for the location. I texted my husband to visit this café hence he could buy some calamansi muffins. I was just curious because Real Coffee and Tea Café is known for their breakfast meal and calamansi muffin. I made calamansi cupcake before and I would like to know if there’s any difference. 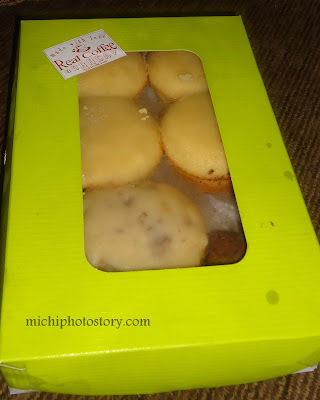 Well, for me the taste is close enough, Real Coffee and Tea Café calamansi muffin P45 is dense, soft and you can really taste the calamansi while my calamansi cupcake is soft and there’s a slight taste of calamansi. My husband likes this better than my calamansi cupcake. Huhuhu! But I will make calamansi cupcake again and add more calamansi juice. My son enjoys the banana walnut muffin P45 and brownies P60 but I find it too expensive for the price or I’m just so kuripot. 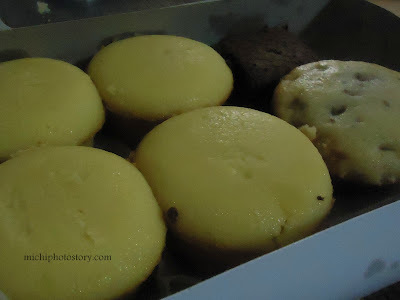 This muffin is really in demand so if you want to buy this as your pasalubong, you can pre-order and pick-up the muffin before you leave. Real Coffee and Tea Cafe is located in station 1, landmark is Astoria Boracay, enter the small alley on the right side and you will see the cafe. My mom wanted me to visit my grandmother every month so starting this year again I do visit my grandmother every month but because of busyness sometimes we only stay for few hours but if we’re not in a hurry we will sleep there, if you remember my term “eat, sleep and run”. But before we go home we try to visit one place listed in Viaje del Sol so two weeks ago we were able to visit Café Lago and Sampaloc Lake. Again, we don’t know how to get to Café Lago so we used the GPRS to get there. We’ve been following the GPRS but we’ve been running around in circles and we can’t find our destination. According to GPRS, we’re one minute away to Café Lago but we feel that we’re lost so we stopped using the GPRS and asked for directions, lagpas na pala kami. When we reached Café Lago, we checked our location in GPRS and we found out that GPRS is not 100% accurate but it is still helpful. 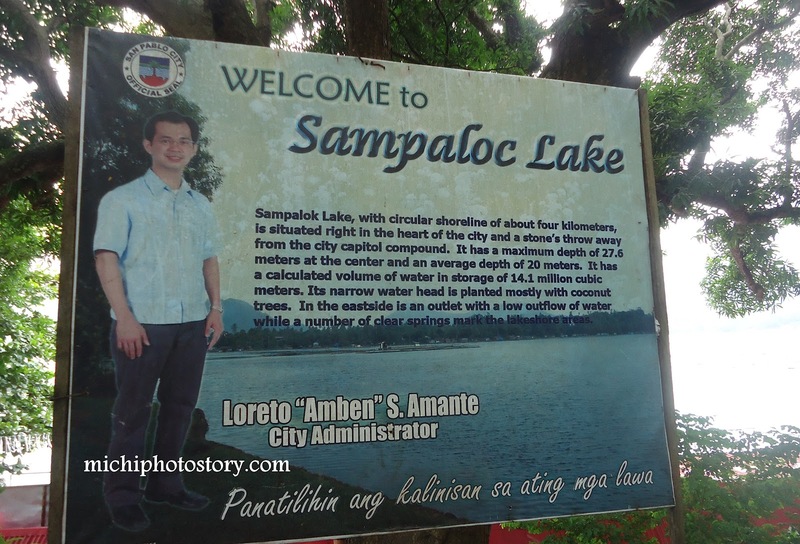 Sampaloc Lake, with circular shoreline of about four kilometers, is situated right in the heart of the city and a stone's throw away from the city capitol compound. It has a maximum depth of 27.6 meters at the center and an average depth of 20 meters. It has a calculated volume of water in storage of 14.1 million cubic meters. 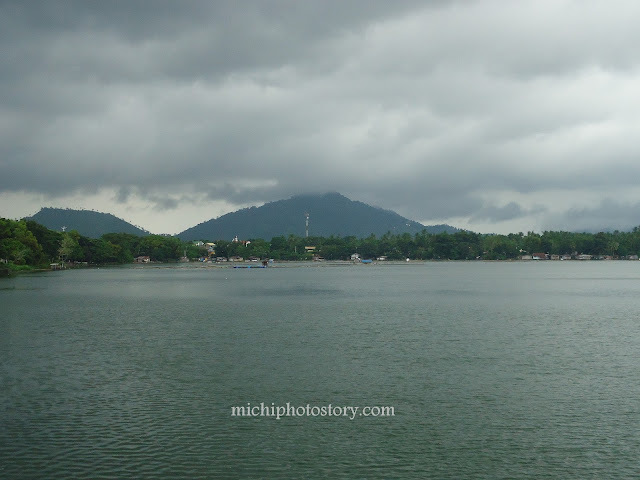 Its narrow water head is planted mostly with coconut trees. In an east side is an outlet with a low outflow of water while a number of clear springs mark the lake shore area. 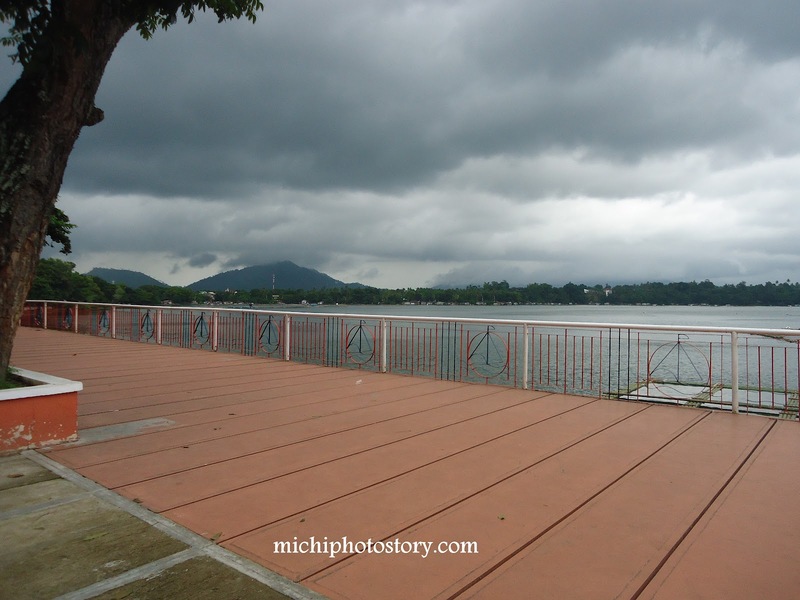 Café Lago is a small restaurant just in front of Sampaloc Lake. Good thing that we went there early because after few minutes, 21 people came in to eat their lunch. 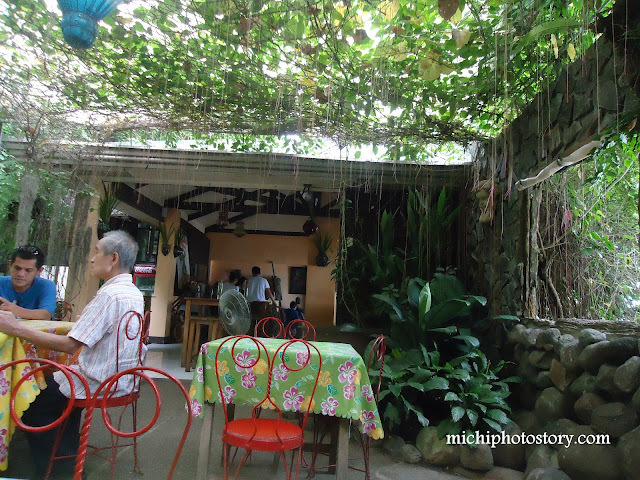 The group came from Casa San Pablo which I also plan to visit, someday. While waiting for our order we took some pictures. We ordered Fern “pako” salad P150 and Crispy Binagoongan P245. 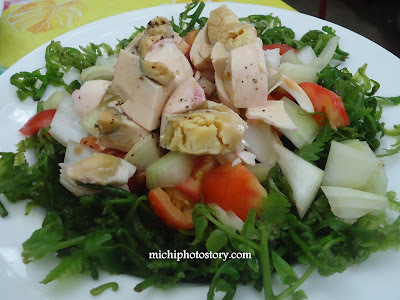 My husband enjoyed his Fern Salad and even my son ate it. 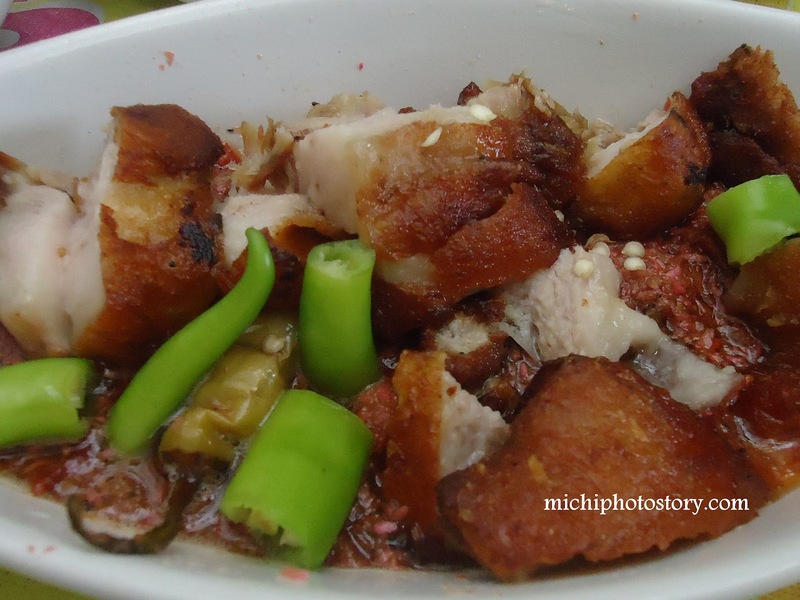 Crispy Binagoongan is just ok for me.